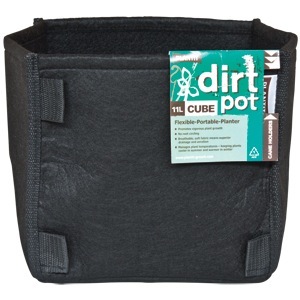 PLANT!T Dirt Pot offer value and versatility to all gardening enthusiasts. Made from porous breathable fabric. PLANT!T Dirt Pots allow your plants to thrive, promote exceptional root health and vigorous plant growth. The soft-sided construction allows the planter to conform to your terrain, making them the perfect choice for all growing areas. The planters have reinforced seams and strength-tested fabric, so they will not tear when supporting even the heaviest crop. The benefits of the PLANT!T Dirt Pot are that it manages plant temperatures keeping plants cooler in summer and warmer in winter, there is no root circling and so there is better growth, the breathable fabric means superior drainage and aeration, the inclusion of tabs on each corner to allow for the use of support canes and it air prunes your plants' roots. and many other types of plants.